The Wool City Rivalry: Class tensions? Bradford football history has been dominated by myths, one of which has been the suggestion that the rivalry of Bradford City and Bradford Park Avenue was based on social class. Its origin has been derived from a superficial understanding of the preceding rivalry of Manningham FC and Bradford FC as rugby clubs. Whilst the claim lends itself to convenient soundbites and a romantic interpretation of history, it is both simplistic and misleading, failing to recognise the historic context and background of specific events. Indeed it reveals more about the political sympathies of those who have propagated such a claim. This article sets out my findings and the reasons why I believe that it is wrong to say that the rivalry was class based. We begin by examining the differences between the two rugby clubs at Valley Parade and Park Avenue respectively. When looking at Manningham FC and Bradford FC there is a danger of seeing them as complete opposites despite the fact that they had a lot in common – even if partisan supporters chose to believe otherwise. Above all, Manningham FC saw itself as a Bradford club and sought the acclaim of Bradford people; its name should not be cited as evidence of a secessionist instinct. There has been a temptation to interpret the history of the senior Bradford clubs as binary, much the same as Glasgow Rangers is differentiated from Celtic in political or religious terms. The personalities of the Manningham and Bradford clubs came to be defined in the 1880s, the decade in which Manningham FC emerged as a challenger to the Park Avenue side. Bradford FC saw itself as an aristocrat of Yorkshire rugby by virtue of its heritage and its commercial success in the late 1880s fostered a distinct arrogance, described as a ‘high and mighty’ attitude. The club was quick to boast of its achievements in a manner that could be compared to that of a brash, self-made man. By the end of the decade the club’s annual tours had become infamous, said to be done in regal style with questions of cost a mere detail. According to Alfred Pullin in The Athletic News of 18 November, 1889 they were characteristic of the club. Within Bradford the Park Avenue organisation jealously guarded its status as the senior ‘town club’, that is to say its principal representative. Manningham FC existed as an alternative to Bradford FC and it would be naive to pretend otherwise that Bradford’s high and mighty blustering during the was to everyone’s taste. Nonetheless, it is dangerous to generalise why people chose which club to support beyond the most obvious reason, which side of the district someone lived. It is equally simplistic to label the rivalry as that of ‘establishment against working class’ to provide a romantic, class-obsessed narrative. Both clubs were equally part of the ‘establishment’ and Manningham was hardly a revolutionary construct. As far as political affiliations were concerned, as I outline in my books Room at the Top and Life at the Top, both organisations had a predominance of Conservative Party activists in their leadership. A more meaningful contrast between Bradford FC and Manningham FC was that between a high church and a chapel. The grandeur and pomp of Park Avenue contrasted with the functional, non-pretentious and ordinary character of Valley Parade. The rivalry of the two clubs was intense and defined by grudges on both sides. Manningham FC perceived bullying by Bradford FC as a much larger club seeking to maximise its advantage at its expense. (In this regard there were a number of episodes that had caused bitterness including attempts to exclude Manningham from the top table of Yorkshire rugby in 1883; the controversy over a postponed cup tie at Park Avenue in 1887 that Manningham considered had been calculated to avoid home defeat; the attempt to exclude Manningham FC from a new league in 1892; and the poaching of players. For the record, such behaviour was not unique to Bradford FC even if it was considered the arch-proponent and it is recognisable to us nowadays in the conduct of so-called ‘big’ soccer clubs in relation to smaller brethren.) Bradford FC considered Manningham FC an economic threat to the viability of its Park Avenue investment, considered tantamount to treachery from the perspective of Bradford sport. Manningham FC’s raison d’etre from its formation in 1880 was its geographic catchment and its original development can be attributed to the fact that it provided an opportunity for a team to play in Manningham, tapping into the latent demand. By definition those who played for Manningham would have done so because they were unable to play elsewhere, possibly as a result of constraints of travel time or the fact that opportunities or vacancies to play for another side did not exist. This provided a further distinction with Bradford FC in that Manningham FC was more embedded within the local community than Bradford FC. With regards to the latter, many of the players lived out of town and spectators were drawn from across Bradford as well as outlying places. It is recorded that high profile fixtures at Park Avenue often attracted enthusiasts from across Yorkshire. The traditional basis of supporting Bradford FC was as the town club whereas the basis of support for Manningham FC was the proximity of the ground. Prior to 1879 the Bradford FC team had comprised mainly middle class players and its location at Apperley Bridge, outside the town centre, was a factor that led to the social exclusivity. This changed with the move to Park Avenue and between 1880-83 the majority of players came from artisan backgrounds. Between 1883-92 Bradford FC established a reputation for itself as a team of celebrities including leading players poached from other Bradford clubs, Manningham FC included. The players became known for their partying and the middle class background of the majority led to the description of a ‘cuff and collar’ brigade. The social transformation of the team in this period arose because it became fashionable to play at Park Avenue and the club was able to attract a number of university graduates who were skilful rugby players. Once more, after 1892 the team comprised largely working class players, to all intents quasi-professionals. It was not unique to Park Avenue for there to have been favouritism in team selection and this served to alienate other players, a number of whom transferred across to Manningham FC. Personal bitterness was thus an ingredient in the rivalry, best illustrated by the ill-feeling of club stalwart and future Manningham FC captain William Fawcett. However, to suggest that this was exclusively a matter of class identity would be a simplification. During the first decade after formation in 1880 the Manningham FC players were predominantly working men, typically with skilled backgrounds. Yet they were not exclusively working class with occupations including a reverend, teacher, jeweller, salesman, surveyor and lawyer. As at Park Avenue, after 1892 players tended to be quasi-professionals from ordinary working class backgrounds. There was far greater change in the social composition of the team at Park Avenue than within Manningham FC between 1880-1903. A crucial change at Valley Parade was that by the late 1890s Manningham FC was forced to look outside the club and its historic membership to secure the expertise and business acumen necessary to survive. In general it could be said that the influx of new people from different backgrounds at Park Avenue tended to be players whereas as Valley Parade they tended to be administrators. Both rugby clubs relied upon working class communities for their mass support and this continued with soccer. In the case of Bradford FC, Park Avenue was a far more convenient venue for people living to the south of the Town Hall along the Manchester Road / Bowling corridor where the terraced housing confirmed a predominantly working class population from which a mass of support was derived. The followers of both clubs sought to exaggerate their differences for fear of losing their identity (a phenomenon known as the ‘narcissism of differences’) and it is incorrect to suggest that Bradford and Manningham were the equal opposites of each other – to do so is to ignore that they had much in common. Just as it is wrong to suggest that somehow Bradford FC was supported exclusively by middle class followers, it is incorrect to suggest that Manningham FC’s support was exclusively working class. Take for example the club’s tour to Paris in 1894 and the 145 people who travelled, paying £4 for the privilege (the equivalent of three to four months’ pay for a working man). This was hardly within the reach of unskilled working men. There has been a temptation to assume that the two clubs were socially homogeneous, monolithic bodies and to believe that the members of each were representative of spectators at large. It needs to be remembered that the activists who made the decisions constituted a small proportion of the total spectators at either ground. There would similarly have been spectators who opted to follow both clubs, picking and choosing according to the fixture and these people would have classified themselves as football enthusiasts rather than partisan supporters. Manningham provided an alternative option to Bradford and if you were able to attend games at either ground, it was a great opportunity to have the choice. Despite statements about Manningham FC / Bradford City AFC having been a working man’s club, by the end of the nineteenth century it was certainly not led by working men. It suited the leadership at Valley Parade to promote the club’s populist credentials in this way. In doing so, it benefited the club commercially to emphasise links with the local community and this fitted into the ‘One Nation’ political creed that was prevalent among Conservatives. To assume that because the Manningham or Bradford City leadership spoke of the club as a working man’s club it meant a labourist affiliation aligned to class struggle is widely adrift. Working class conservatism had been ingrained at both Valley Parade and Park Avenue from the beginning. The links with the Volunteer movement fostered support for the military and imperial conquest, demonstrated in 1884 – at the time of the Sudan crisis – by the adoption of claret and amber regimental colours by Manningham FC. Another illustration was Joseph Burrow, a founder member of Manningham FC in 1880 who was later the chairman of Bradford East Division Men’s Conservative Association. The championing of recreation and rest from work was surely a major factor explaining the strength of working class Tory sympathies in industrial Yorkshire. However, the original link between Bradford Cricket Club and Benjamin Disraeli’s Young England movement has not, to my knowledge, been previously identified in histories of Conservatism in the north during the Victorian age. Two key events in the 1890s have been seized upon to link Manningham FC with class struggle. The first of those relates to the Manningham Mills strike, the second to the formation of the Northern Union in 1895. The strike at Manningham Mills of 1890/91 was a particularly bitter affair and there has been the suggestion that Manningham FC became entangled in the strike by offering support. As I outline in Life at the Top, it is a contrived connection that doesn’t bear scrutiny. Indeed, the club president James Freeman was head of the City of Bradford Watch Committee that supervised the policing of the strike. To suggest that Manningham FC was at the forefront of class politics is therefore utter fantasy. The status of Manningham FC as a founder of the Northern Union in 1895 has also been highlighted to suggest that it seceded from the Rugby Union as a champion of working class players. Again, it is a fanciful myth. The traditional narrative about rugby league gives considerable emphasis to class politics and this has been cited as the underlying cause of the 1895 split. As I argue in Life at the Top, finances had more to do with the breakaway and the principal driver of change was the basic need of all (rugby) football clubs to pay their way (make a profit) and service their debts (generate sufficient cash). Whilst the language about class undoubtedly reflected cultural prejudices of the time – and on occasions was raw – the reason why the Manningham and Bradford clubs opted for the Northern Union in 1895 (and then association football in the decade following) was not as part of a crusade to safeguard the interests of the working class, rather they wanted to protect their own balance sheets. It is notable how myths have evolved about 1895. Indeed, the broken-time initiative was essentially an instinctive capitalist response by football administrators to protect profits and curb the bargaining power of players. The cynic can argue that the myths were encouraged precisely because the split was driven by economic interests at the expense of smaller clubs and that it was not universally popular. Both Manningham FC and Bradford FC were among the 22 founder members of the Northern Union. When the latter eventually converted to association football in 1907 – and at one stage there was even discussion about re-joining the Rugby Union as an amateur club – the accusation was made that the Park Avenue club had never been committed to the Northern Union. Whilst this was coloured by the politics within the Northern Union and the opposition of Bradford FC to reforms of the game in preceding years, the argument was based on the circumstances relating to the establishment of the Northern Union in 1895 and the apparent reluctance of Bradford FC to commit to the initiative. Whereas Manningham FC had expressed enthusiasm for a Northern League based on the payment of broken-time from when it was first discussed in March, 1895, Bradford FC only confirmed its involvement at the last moment in late August, 1895 when it faced the risk of the remaining clubs going it alone. However, this overlooks the fact that Bradford FC was far from being a passive agent in the formation of the Northern Union. The club should be credited with having had a realistic assessment of the likely risks that would arise from embarking on what was an enormous leap in the dark. To infer from its muted enthusiasm for the Northern Union that Bradford FC was de facto a ‘middle class club’ and Manningham FC was the ‘working class club’ is completely wide of the mark and is another baseless myth. Manningham FC was proud of the fact that the club had not been beholden to public donations but it was no less a capitalist affair than Bradford FC and nor should it be perceived as a minor club in terms of its revenue generating capabilities. Unlike Bradford FC however, it was debt averse as an organisation. The story of the rivalry was that of two commercial organisations, each with an imperative to survive. By the end of the nineteenth century the business competition between them also mirrored the social competition and one-upmanship between different groups of Bradford’s ruling classes. By 1900 this amounted to an educated, cultured merchant class involved at Valley Parade and industrialists at Park Avenue who had the wealth but were generally considered to lack refinement. Across at Park Avenue it was the conduct of chairman Harry Briggs after 1896 that helped shaped the identity of the Valley Parade club, again by exaggerating the differences. 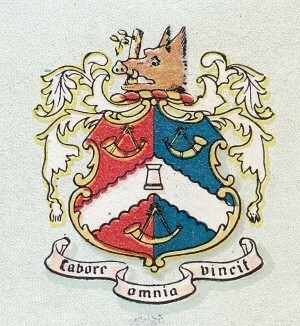 Harry’s father, Edward had guaranteed the borrowings of the Bradford Cricket, Athletic & Football Club and this afforded Harry Briggs unique authority. By 1905 Briggs was actively scheming to introduce soccer to Park Avenue and he became known as the ‘Little Napoleon’. Dislike and fear of Briggs was a big factor in the decision of Bradford City members to reject amalgamation in 1907 and allowed the Valley Paraders to claim that in contrast their club was a model of democracy and good governance. Catton’s article was embedded with the sentiment that the honest toil of Bradford City contrasted with the privilege, wealth and entitlement of Bradford Park Avenue. It was pejorative to suggest that Park Avenue was the home of plutocrats and his description of City as democrats was derived as the polar opposite. The language was aligned with how partisan supporters at Valley Parade defined the two clubs. It painted a struggle of ‘good against bad’, or ‘light against dark’ and offered a romantic vision of Bradford City whilst overlooking the fact that the club had been neither a model of harmony nor of good governance. So too it conveniently ignored the fact that in 1903 Alfred Ayrton had managed conversion from rugby to soccer by stealth and had been careful not to make himself accountable to a democratic vote of all members until the stage that it was a fait accompli. Another previously overlooked theme is that freemasons were heavily represented within the Bradford City leadership prior to the outbreak of World War One. If the Park Avenue club had originally considered itself to be at the heart of the Bradford establishment as the ‘town club’ it is fair to say that its Manningham rival had within thirty years inherited that honour. To suggest that Bradford City AFC as an institution stood aloof from the establishment by virtue of class identity is therefore ludicrous. By the time of its promotion to the First Division in 1908 Bradford City AFC was able to position itself as the civic club in Bradford but there was a subtle shift in its expression of local patriotism. Historically a large element of sporting pride had been derived from the prominence of local players in a team, whether at cricket in the mid-nineteenth century or rugby in the last quarter. The proportion of outsiders or aliens had increased after the launch of the Yorkshire Senior Competition league in 1892 and the trend was well-established by the time of the Northern Union in 1895. In fact, the incidence of foreigners was considered to go hand in hand with professionalism and not surprisingly it was a common feature of Football League clubs. The dearth of local soccer talent meant that both of the Bradford clubs came to rely upon imported players, exemplified famously by the fact that the team that won the FA Cup in 1911 comprised eight Scotsmen, one Irishmen and two Englishmen from Nottingham. By contrast the players who represented the Bradford Northern club formed in 1907 and Bradford RFC, formed in 1919 tended to be locals. The Bradford Northern club actively exploited class identity as a means of securing support, much in the same way that the Rugby League sought to portray itself as a working class sport. My research into Bradford football (rugby and association) identified that issues of class and social mores only became a feature in the controversy leading up to the abandonment of rugby at Park Avenue in 1907. In particular this was to emphasise the credentials of Northern Union rugby as opposed to that of Rugby Union. The amateur Rugby Union code was not extinguished in Bradford in 1895 although like elsewhere in West Yorkshire, by the end of the decade it had virtually disappeared. Post-split, junior clubs struggled to survive and a number converted to Northern Union. However, the amateur teams remained strongly working class in composition. The likes of Shipley FC, Bowling FC or Bowling Old Lane FC chose to remain within the Rugby Union because they opposed the breakaway of the senior clubs which they considered to be at their economic expense. By the beginning of the twentieth century, Rugby Union in Bradford was a minority sport, played at Bradford Grammar School and by the Bradford Wanderers side formed in 1899. It also became distinctly middle class and hence by 1907, when there was the suggestion of reviving Rugby Union at Park Avenue, there was a clear social distinction between the two rugby codes. Northern Union followers emphasised class identity in the face of the potential threat from Union as well as the competition with soccer. The Northern followers tended to emphasise the credentials of their code in preference to soccer as the traditional winter sport of Bradford. Notable is that in accounts describing the respective crowds at soccer and (Northern Union) rugby in the first decade of the twentieth century, the former was said to be generally younger and included more women. By virtue of numbers attending, the experience in Bradford was that before World War One, rugby appealed to narrow segments of the population whereas soccer was far more representative and broader based. In the inter-war years, first Rugby Union and then Rugby League enjoyed greater prominence in Bradford in preference to soccer and it is a reminder that different sports have come in and out of fashion. Likewise the social profile of people attending games at Valley Parade has continued to change with the proportion of families in today’s crowds contrasting to that in earlier decades. I have seen no evidence to suggest that the two senior clubs were defined by sectarian division unlike in other British cities where divisions have been based around relations with those of Irish (catholic) descent. Certainly, there is no mention of Irishmen having been prominent decision-makers at either Park Avenue or Valley Parade. If anything, the leadership of both clubs was likely to have been distinctly unsympathetic to Irish Home Rule and the Irish as a distinct community. Within Bradford as a whole there tended to be negative attitudes and prejudice towards the Irish and public opinion was probably shaped by the Goitside slum, considered to be a haven of crime and depravity. With regards religion, whilst the doctrine of Muscular Christianity was a factor encouraging athleticism in Bradford I do not believe that it can be claimed to have been a dominant influence. The cultural spirit of Manningham FC was attuned with Wesleyanism whilst at Park Avenue it could be said to be nearer to Anglicanism. Edward Briggs for example had been a convert from non-conformism to the Church of England, interpreted for motives of social status. The Bradford Cricket, Athletic & football Club was also situated within the parish of St John’s Anglican church and its curate, Rev James Leighton was actively involved with the club between 1890 and 1911. Across at Valley Parade, longstanding committee member Tony Fattorini was a prominent Catholic. However, whilst religious backgrounds may have shaped behaviours it could not be said that religious identity per se determined the rivalry between Manningham FC and Bradford FC. The story of Bradford football in the twentieth century was the struggle of co-existence. The two clubs were disadvantaged by competing for support in a city that in truth was not large enough to support two successful, leading sides. A good proportion of followers regularly watched both and floated between them. Like any other British football clubs, they relied upon working class people for the bulk of their support. However I have seen no evidence to suggest that the social profile of support differed between Park Avenue and Valley Parade. To apply broad generalisations is dangerous and whilst it is valid to claim that the vast majority of Bradford City support continues to be derived from lower income earning groups, it is ludicrous to suggest that crowds are homogeneous in terms of social background. The social profile of supporters continues to be dynamic and ever-changing. Bradford Park Avenue saw itself as the town club by virtue of its historical pedigree and the grandeur of its ground. Bradford City saw itself as the senior soccer club by virtue of its name, of having been a pioneer in West Yorkshire in 1903, its success in 1911 and the fact that it traditionally enjoyed better gates. The Manningham club had even claimed itself to be the city’s principal representative because Valley Parade was marginally closer to the town hall than Park Avenue. The rivalry of the two became more akin to two bald men fighting over a comb, exaggerating their differences to uphold their identity. Manningham FC and later Bradford City AFC had traditionally been an underdog club that achieved against the odds. Indeed, this was the essence of the bantam nickname introduced in 1908. For Bradford City followers to describe their club as that of the working man became a badge of honour, a form of credentials consistent with the city’s own motto, ‘labor omnia vincit’. It was thus a powerful message in 1907 that melded a litany of historical grievances about Bradford FC when the possibility of merger and relocation to Park Avenue became a distinct possibility. Nevertheless, to take the claim literally is wholly misleading and represents a fundamental error of firstly failing to recognise the context and secondly, wrongly politicising the club’s history. To have described Bradford City as a working man’s club was to emphasise its down-to-earth, no-nonsense character and its reliance upon honest graft rather than a silver spoon. It did not mean that Bradford City was exclusively a club for the working class. Nor did it mean that its point of difference with Bradford Park Avenue and its rivalry was based on social class. Even more ludicrous is the inference that the club and its supporters subscribed to the equivalent of what we would recognise today as a labourist or left wing political agenda. John is the author of ROOM AT THE TOP and LIFE AT THE TOP which tell the story of the origins of sport in Bradford and the rivalry between the Valley Parade and Park Avenue clubs leading up to conversion to soccer. He is currently working on another book that will narrate the history of the City-Avenue rivalry between 1908-74. Forthcoming features scheduled to be published on VINCIT: George Chaplin of BCAFC; the formation of Bradford Cricket Club and the origins of cricket in Bradford; Bradford Park Avenue, 1967-70; Cricket – the DNA of Bradford sport; Keighley AFC 1896-1901; the impact of the railways on Bradford football; the earliest Bradford football clubs and the story of Bradford’s long forgotten junior rugby clubs. YOUR CONTRIBUTIONS are welcome! We seek to feature the history of sport in the Bradford district irrespective of club or code.